1.Take Coriander Powder, Cumin Powder, Turmeric Powder And Chilli Powder In A Mixing Bowl. 2.Also Add Hot Spice Mix (garam Masala), Salt, Gram Flour And Chopped Coriander Leaves. 3.Now Coat The Length Wise Chopped Raw Banana Pieces With This Mixture. 4.Heat Oil In A Pan And Roast Bay Leaf. 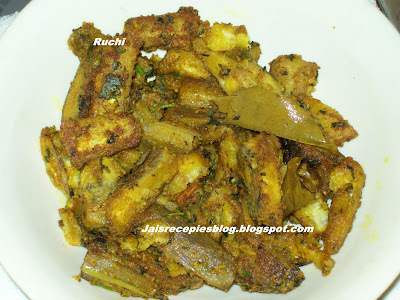 5.Now Add The Spice Coated Banana Pieces And Cook. 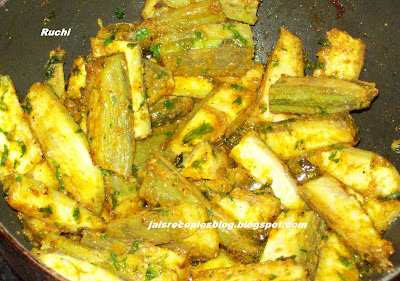 7.Green Banana Fry Is Ready To Serve. Usha has given me given me a butterfly award. Thank you so much! Thank you very much Usha for passing this award. I like it! Little variation....from what we usually do....count me in! I want to try this recipe coming sunday! I devour Plantain curry with rice and dal,Yummy! That looks really delicious,using dry mango powder is nice idea! 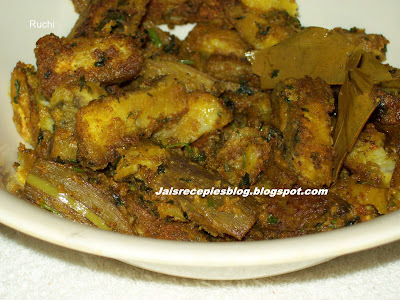 Hi Jaishree, you have a nice collection of recipes. For some reason i was not able to open your blog till today. I tried today and i'm glad i found your blog. Lots of yummy recipes. Sounds good, Jaishree - Nalla rujya irundurukkum!! I always make chips with them.....never tried it asa curry. Hi Friends, thank you all for sweet comments..